Let’s face it – cats will always have things their way, no matter what they have to do to achieve it. They are also quite lazy at times and see absolutely no problem in their chosen lifestyle, which revolves around eating, sleeping and playing for as much as they possibly can. But this little champ takes things to a completely new level. He abhors the leash and absolutely refuses to be taken out for a walk – by pretending to be dead. 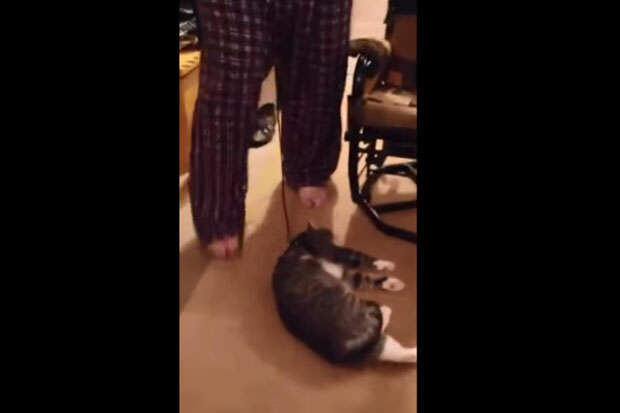 We don’t know what’s funnier, the cat’s behavior or the owners’ laughter. What do you think? Next Story → These Cats Will Steal Your Bread If You Aren’t Careful!